DreamWorks Animation has been working on a 3D animated iteration of the classic “dog and his pet boy” cartoon Mr. Peabody and Sherman for a few years now, but the first image from the feature film has now surfaced. The original cartoon first appeared as part of the Rocky and Bullwinkle show, and DreamWorks Animation’s version boasts the voice talent of Ty Burrell (Modern Family) as the dog and Max Charles (The Amazing Spider-Man) as the boy. The story finds Peabody’s “pet boy”using the genius dog’s time machine without permission, thus sending events in history spiraling out of control. 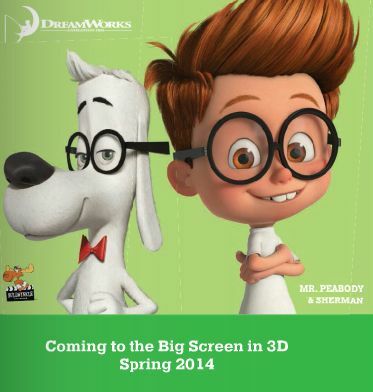 Hit the jump to check out the first image of DreamWorks-rendered Mr. Peabody and Sherman. The film opens in 3D on March 14th, 2014. Based on Jay Ward’s classic cartoon, Mr. Peabody is the world’s smartest person who happens to be a dog. When his “pet” boy Sherman uses their time traveling WABAC machine without permission, events in history spiral out of control. It’s up to this most unexpected of “father-son” teams to somehow put things back on track before the space-time continuum is irreparably destroyed.